The 21-days Training programme on Entrepreneurial Skill Development for second batch of 45 graduating students from Acharya N.G. 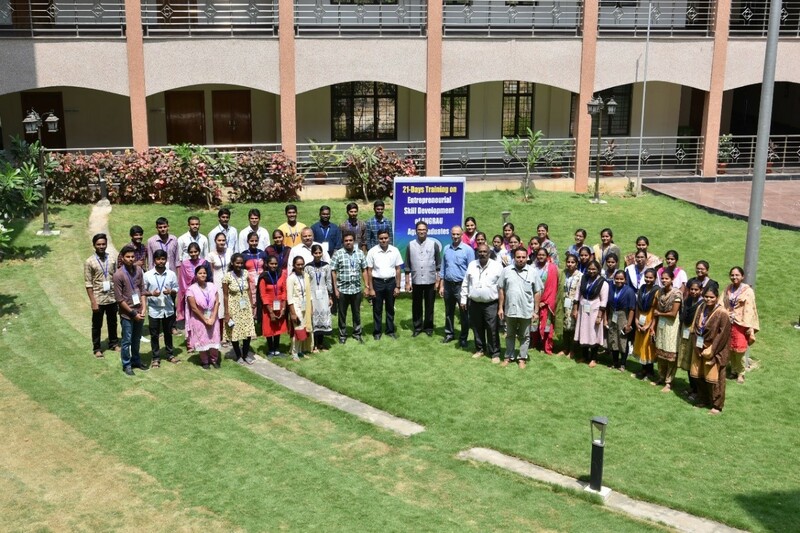 Ranga Agricultural University (ANGRAU) was conducted during March 20 – April 09, 2019. The programme was organized under NAHEP- Institutional Development Plan (IDP) scheme. The batch comprised 33 girls and 12 boys from five different colleges of ANGRAU. These are the final year students of B.Sc. in Agriculture/Agricultural Engineering from five different campuses under ANGRAU attended the programme. The training programme was designed specifically to impart entrepreneurial skill to the graduating students along with enhancing the soft skill among them. The sessions included modules on entrepreneurship concepts, emerging opportunities in agribusiness sector, marketing, data analysis, business communication and soft skills, ICT use, business models, and business plan preparation. The students got opportunities to interact with 10 successful agripreneurs, who shared their experiences of starting the business. Apart from visiting fruits & vegetable market, start-up enterprises and interviewing with 100+ farmers in and around Hyderabad, the students also visited AIP and i-Hub, the business incubators of ICRISAT. Dr. Peter Carberry, Director General, ICRISAT during his interaction encouraged the students to take up entrepreneurial journey to solve the multitudes of problems bothering smallholders in India. The young minds were provided with the opportunities to brainstorm for identifying the problems with the opportunities for entrepreneurial innovations, working with their team for validating their hypothesis, got feedback from start-up experts, refining the business plan and finally making pitch presentation. Smt. V. Usha Rani, Director General, MANAGE, Hyderabad was the Chief Guest during the valedictory session. She urged the student trainees to bring innovation in life and acquire the features of entrepreneur be it in government service, private job or in business. This would help in succeeding and bringing difference. She also quoted numerous entrepreneurs who are setting examples for others.